'Prizrak Schastiya' Призрак счастья (Zoya Dolganova, R. 2013) Sdlg. 3-1-93. JI (6 F.), 31-35.5, Midseason bloom. Style arms white with disappearing light blue dabs, Falls white, light blue dabs disappearing on third day, signal yellow, yellow rays to middle of falls. Parentage unknown. A Group of Japanese. Plant height of 87 cm, the peduncle straight, strong, length 83 cm, on the Bush 4 PCs. 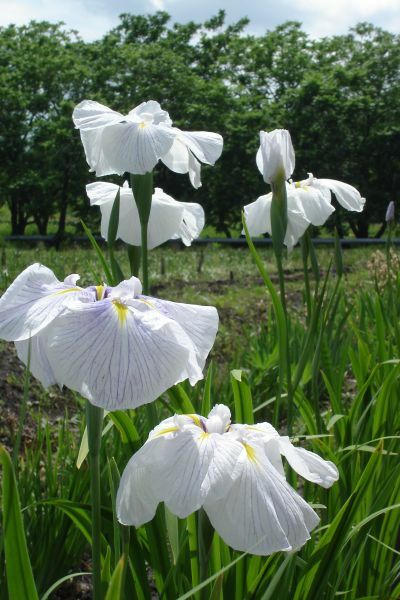 A peduncle is directed upwards, have 2 flowers, the size of 14x10 cm, with rounded broad petals, white color with pale lilac strokes. Blooms from early July, for 15 days. Disease resistant. Winter-hardy. Universal.